A must-have companion to 3D Molecular Designs’ popular Amino Acid Starter Kit©, ß-Globin Folding Kit©, and Insulin mRNA to Protein Kit©. These laminated posters show students the link between the triplet codon in mRNA and amino acids. 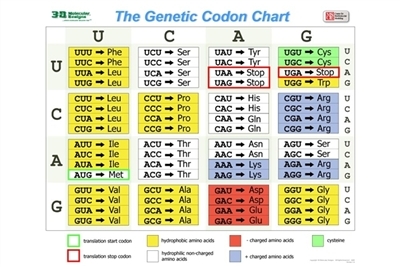 The 3DMD Genetic Codon Chart and Genetic Codon Circle use the same standard color scheme as 3DMD’s popular Amino Acid Starter Kit©, ß-Globin Folding Kit©, and Insulin mRNA to Protein Kit©: hydrophobic amino acids are yellow, polar amino acids are white, acidic amino acids are red, basic amino acids are blue, and cysteines are green. 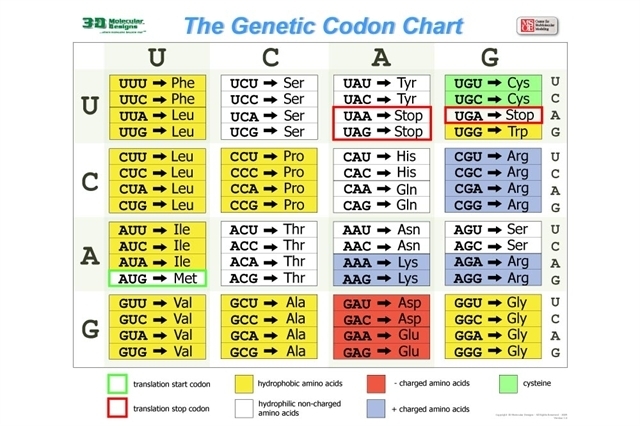 By applying this same color scheme to the laminated Genetic Codon Posters, your students can easily build a seamless connection between the triplet codon in mRNA and the chemical property of the amino acid it encodes. The Genetic Codon Circle© is laminated and measures 30”x24”.